Having been under the weather for the last twelve days, I couldn’t wait to get back to the kitchen and garden. I have had an odd craving for my favorite caramelized fennel and onion recipe—bizarre of all the tastes and smells one could desire, as I have been way too congested to taste, let alone smell the coffee brewing or Daphne just outside my door. When the body craves certain things, one should LISTEN… This doesn’t count when talking about artificial taste manipulation of Doritos or chips, but rather when the body/mind is actually craving tastes of REAL FOOD. Fennel– cooked—has cooling and anti-inflammatory properties. Fennel Foeniculum vulgare—can also work It is also recommended to calm a lot of coughing. This must be why I must be craving it with all the coughing I’ve been experiencing with this winter grunge—Check! Onion–Allium cepa has expectorant, diuretic, anti-bacterial properties —Check! Thyme –Thymus vulgaris provides anti-microbial cleansing, works as an expectorant, as well as strengthening the Immune system—the smell cheers the heart and lifts the spirit—Check—I am ready for the Grunge to be gone! Tarragon– Artemisia dracunculus calms the nervous system—love tarragon!—Check! Pernod—is a pricey liqueur with star anise Illicium verum – Did you know that star anise is the main ingredient in Tamaflu! In Chinese medicine star anise is a warming herb that moves cold stagnation—who knew—thanks Wikipedia!—Check!—Check! So now the cravings are making perfect sense! 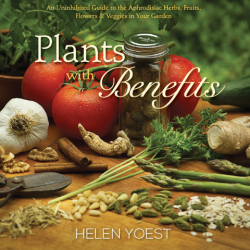 Plants with Benefits… An Uninhibited Guide to the Aphrodisiac Herbs, Fruits, Flowers and Veggies in Your Garden. This book discusses cravings of another sort! OH MY! What a great book to give yourself for Valentine’s Day! A whole new dimension to round out gardening and culinary pursuits! Plants with Benefits… is easy to read, with beautiful photography. You do not have to have a Horticultural degree to reap it’s benefits… Helen will have you blushing; I guarantee you will never look at some of your basic ingredients the same way again! 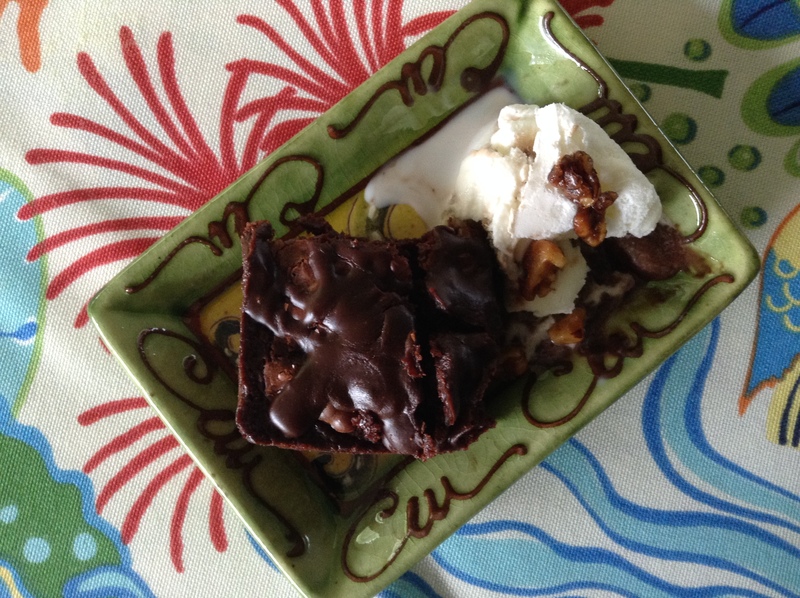 Yes, there are recipes— many by the wonderful Carolyn Binder of Cowlick Cottage Farm, in case you are brave enough to put these ingredients to work! Ten more reasons to get this book! It is thought provoking: Do I dare go to the produce department? Will I have to be restrained from fondling? No wonder they provide brown paper bags in grocery stores—Hmmm! I have never thought of Fennel as Helen writes as, “Straight from the Kama Sutra.” If you don’t know what I mean google Kama Sutra! Just how do they do that? But I will never look at a Fennel the same again! It’s all naughty but nice fun. When feeling a little better I might try using Absinthe to plant the “Seeds of Desire”— instead of healing Penod! 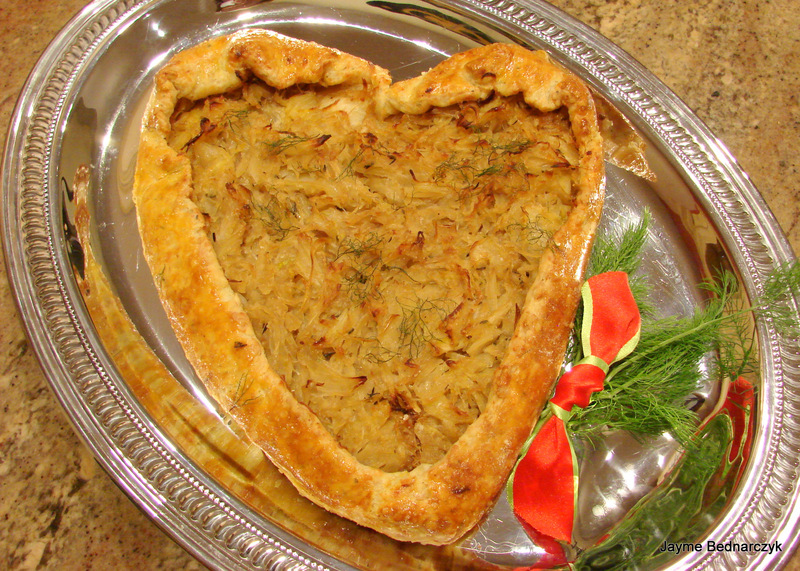 So here we go—a great dish adjusted for Valentine’s day! Plants with Benefits will get you playing and loving in the kitchen again! Thanks for the inspiration Helen! This one’s for you! 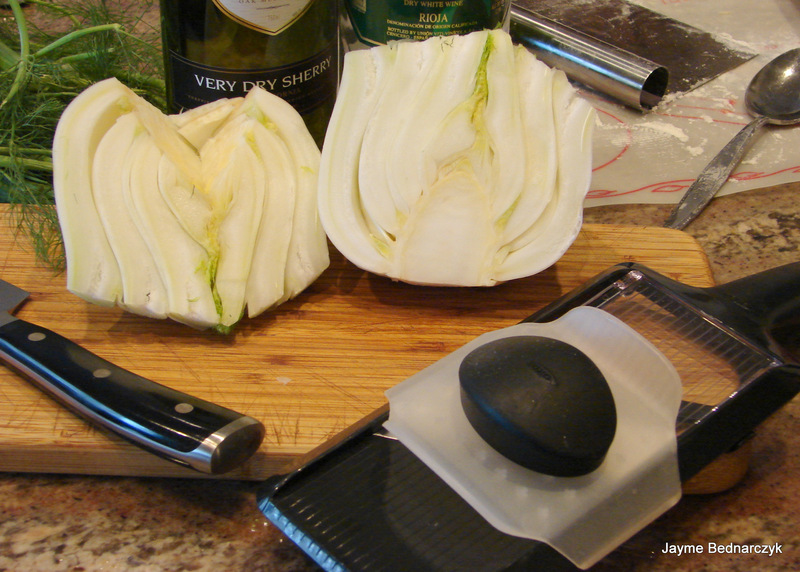 A madolin makes slicing fennel and onions a snap! *Note: A Mandolin works wonders! I bought an OXO hand held – at $19.00 an inexpensive one—it works Great!… I resisted purchasing one for years… now I use it all the time! 1. In a food processor—add the flour, tarragon and salt to the bowl of a food processor. Pulse about 3-4 times to combine. 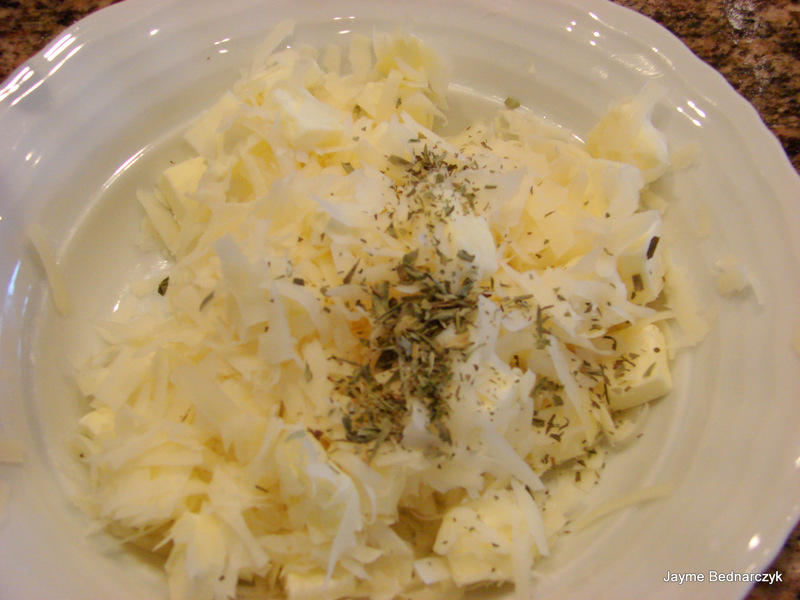 Add the cubed butter and grated cheese to the bowl and pulse until the size of the butter resembles small peas. This can also be accomplished by hand using a pastry cutter. I like to mix the flour, tarragon and butter together before adding to the food processor. 2. In a small bowl, whisk together the sour cream, lemon juice and water and add this to the butter-flour mixture in the bowl of the food processor. Pulse several times until the dough starts to hold together when pinched between your fingers. 3. Lightly sprinkle flour on the counter and dump out the dough. Using a bench scraper, push the dough into a 12- by 4-inch rectangle. Using the palm of your hand, push the dough away from yourself. Once you have pushed out all of the dough, repeat the process. After the second round of pushing out, use the bench scraper to form a 4-inch thick round. Cover the dough in plastic wrap and chill in the refrigerator for about an hour. 1. In a large sauté pan (12-inches) melt the butter over medium-low heat. Add the fennel, stir to coat with the melted butter and sauté for 10 minutes. 2. 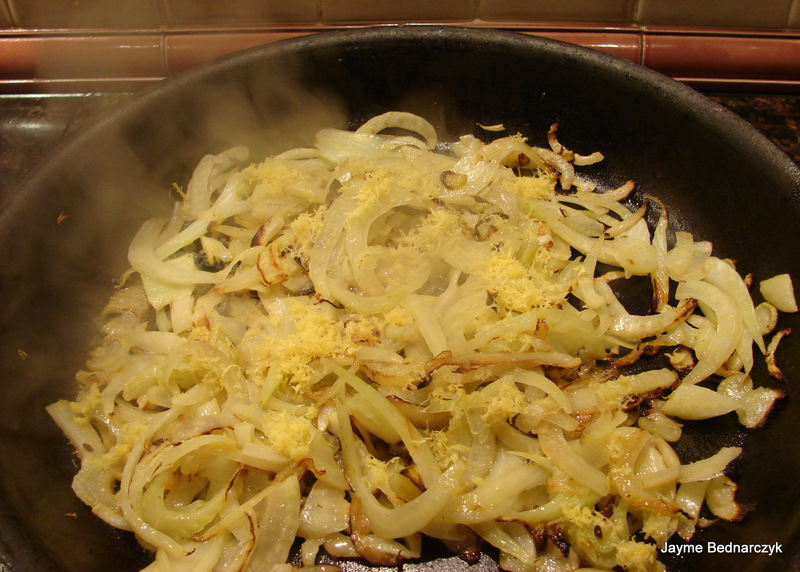 Add the onions and thyme and sautè for 25 minutes, until the onions and fennel are very tender and caramelized. Oh the joyous aromas of fennel, onions and thyme! 3. Pour in the brandy, sherry and wine and deglaze the pan by scraping the brown bits off the bottom. 4. 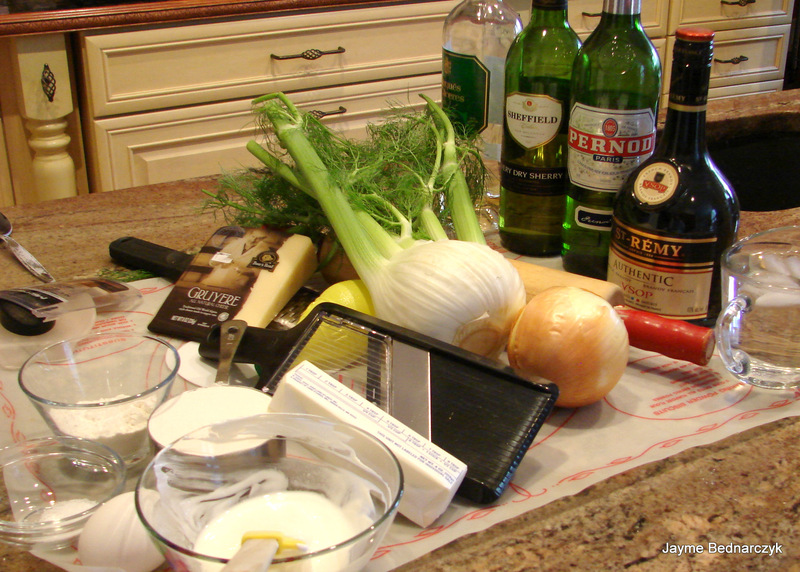 When the fennel and onions are fully cooked, add the Pernod (or liquer of choice) and season with salt and pepper to taste. Baking – Preheat the oven to 350 degrees. 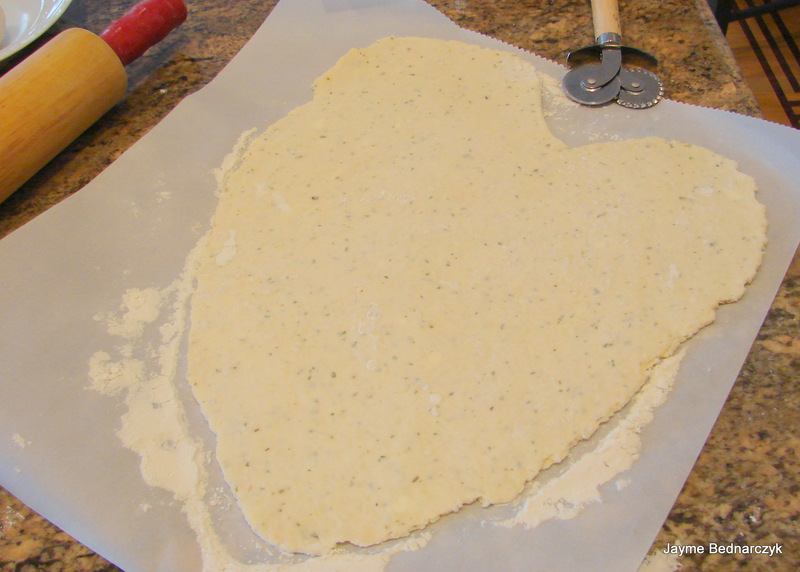 Roll out the dough on a piece of floured parchment paper until it is about 12-inches in diameter. (if making heart shaped roll out a rectangle… eyeball the shape remembering that about 2 ½ inches will be folded in). Put the parchment and dough onto a baking sheet. Chill the dough in the refrigerator for about 15-20 minutes. Take the dough out from the refrigerator. 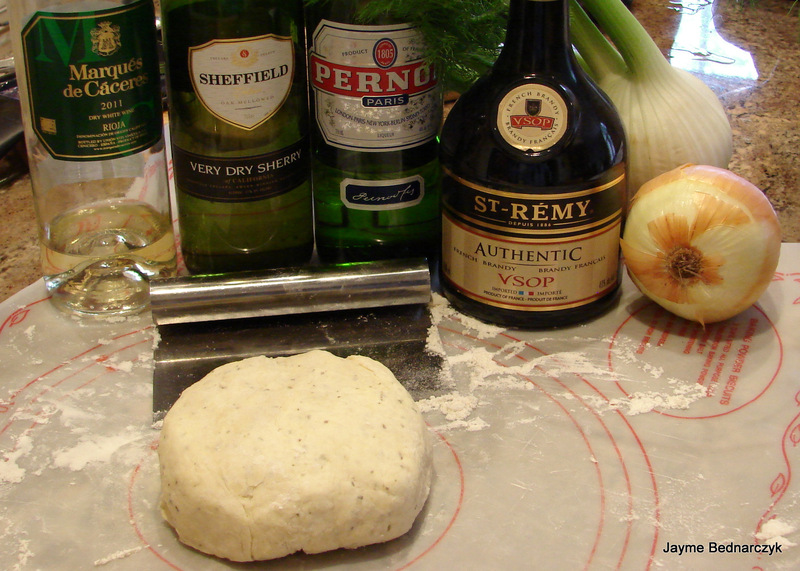 Mound the fennel-onion mixture in the middle of the dough, leaving a 2-1/2-inch border. Break off some of the fennel fronds and sprinkle over the top of the filling. Fold up the outer 2-inches of the dough over the filling, leaving 1/2-inch inside the fold free of filling. Brush the dough with the beaten egg yolk and sprinkle with salt and cracked pepper. Bake for 50 minutes until the crust is deep golden brown and the middle of the filling is hot to the touch and lightly browned. Cool the tart on a rack for 10 minutes. Carefully remove the parchment and let the tart continue to cool on the rack for at least 10 minutes. Serve warm or at room temperature.